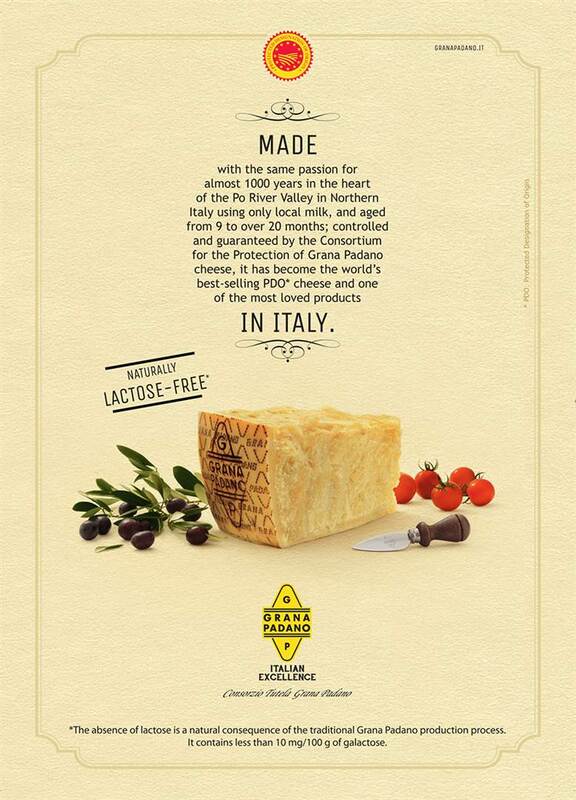 Grana Padano is naturally free of lactose due to the characteristics of its production and ageing process. Galactose content less than 10 mg per 100g. The basic absence of lactose in Grana Padano PDO – a consequence of its natural production process as rigorously laid down in its official Specification Rules – means that people intolerant to lactose can assimilate it without problems, thus allowing them to benefit from the extraordinary nutritious content of the milk and the bioactive properties of cheese. After 9 months of ageing (the minimum time established by its PDO Specification Rules), this cheese is substantially free of lactose, ready to be consumed by adults and children who show intolerance to this sugar, that’s to say, devoid of the lactase enzyme. Furthermore, Grana Padano PDO has a residual galactose content of less than 10 mg/100g (Lucia Monti et al. (2017). Lactose, galactose and glucose determination in naturally "lactose free" hard cheese: HPAEC-PAD method validation. Food Chemistry, 220, 18–24). Thanks to these characteristics, this cheese is recommended for diets with a low FODMAP content (Fermentable Oligo-di and Mono-saccharides, and Polyols) (P.R. Gibson & S.J. Shepherd, 2005). Lactose free recipes Recipe with naturally lactose-free Grana Padano, for healthy eating with 100% Italian cheese. Hypertension A new study recently released shows findings that Grana Padano PDO cheese can aid in the fight against chronic blood pressure conditions like hypertension. Nutritional properties Thanks to Grana Padano’s raw materials, it has great nutritional qualities. Activities for children and schools Grana Padano Consortium is attending numerous initiatives designed for children and schools, with educational aims of good nutrition and good eating habits.